Modern CHROs are emerging from traditional silos to work hand in hand with other C-suite executives. When Honeywell International—the global engineering, aerospace and consumer-products giant—decided it needed to cut costs through a companywide organizational-efficiency initiative, the firm turned to an unlikely source to shepherd the project: its top HR executive, Mark James. But James did such a good job with that project—working closely with finance leaders and Honeywell’s other top executives across disciplines and departments to identify more than 200 money-saving moves—that for the next eight years his higher-ups gave him the added task of running the firm’s procurement operation, even as he continued to manage HR and communications. To James, the link between managing people and running procurement for the firm—which has 131,000 employees and pulled in more than $40 billion in revenue in 2017—is not as odd a fit as some might think. James says he created a great deal of cross-pollination; for example, he used his HR skills to recruit and train the best talent to run procurement, he says, but he also took some of the tricks he learned for reducing procurement costs—methods he slyly calls “our secret sauce”—and brought those negotiating practices into people management, saving additional dollars. The line between HR and finance, James adds, is an increasingly blurry one. “We get the true cost of every single employee … what they spend on travel and entertainment, what are the benefits costs, and whatever training or computer costs—all the costs associated with any employee anywhere in the world—and we have mathematical models of when we should and shouldn’t add people,” he explains. So when Honeywell is deciding whether to hire employees in Brazil or China or Alabama, officials now know exactly where it will be most cost-effective. Recently, Honeywell, based in Morris Plains, N.J., made some changes in the C-suite that moved procurement into the orbit of a new executive, but James was immediately given a new task: managing security, including the complexities of handling cyber threats. He says his broad and expanding portfolio at the multinational giant isn’t so much a reward for unique expertise in a given area but rather for his curiosity and willingness to learn about every aspect of the complicated business, and to work across traditional lines in developing new strategies. Perhaps unintentionally, over the last decade at Honeywell, James has established himself as a role model for a new breed of a human resource leader in the 21st century. As a “boundaryless CHRO,” he represents someone who has busted free from the constraints once imposed on HR leaders in a past era of silos to instead work closely with the other most strategic-minded leaders in the C-suite, and to take on roles and special projects that touch on any and every aspect of the business. Boundaryless CHROs—such as James, Donna Morris at Adobe or HP’s Tracy Keogh—increasingly display their newfound prominence through their ever-lengthening office nameplates as they oversee areas such as the customer experience, facilities management, philanthropic programs or even procurement, all while continuing the complex task of running HR. To consultant Eva Sage-Gavin of Accenture—herself a former HR executive at several Fortune 500 companies—the concept of a boundaryless CHRO extends well beyond thicker portfolios; it also reflects the growing importance of creative people management in the overall business strategy, as well as increasing overlaps between employee experience and customer experience. Today, notes Sage-Gavin—Accenture’s senior managing director for talent and organization—the value of a CHRO who’s not walled in by a narrow mission is widely accepted. “We’re all making a wide pivot to new business opportunities that are disruptive—and we have to disrupt ourselves,” she says. “The future of business—the future of work—requires tapping an ecosystem’s agility, and it requires lots of flexible skills coming together to determine an outcome.” As experts in organizational design, Sage-Gavin says, CHROs are best equipped to be at the center of that transition. Of course, not all CHROs take on such expansive roles. Often, according to both experts and HR leaders who’ve broken down some of the old barriers, success navigating the C-suite and taking on important new missions depends on the vision and understanding of the CEO and his or her views on the importance of HR within the business. But leading consultants say that companies that cling to a 20th-century vision of HR as a narrowly defined department, grappling only with quotidian problems like benefits management, are missing out on how savvy people management can make the difference between profits and losses. Ravin Jesuthasan, a managing director and global practice leader at Willis Towers Watson, has found that, while a couple decades ago CEOs were demanding highly technical skills from each of their top lieutenants, these days they want strategic thinking and seek to infuse every key project with clever people management. They also want the organizational skills that top CHROs bring to the table, he says. HR executives have become critical “in helping organizations navigate this new economic system of work”—with decisions on issues such as outsourcing, hiring temps or using robotics becoming critical to business success. “How do I help a business decide whether to hire or decide whether to use UWORK or Manpower or Kelly [Services]?” Jesuthasan asks. “Where does automation make more sense?” To make those calls, he explains, an effective CHRO is working more closely than ever before with finance, IT and other business leaders. Ram Charan, a veteran business consultant to CEOs, co-authored an influential 2006 article for the Harvard Business Review that called for elevating the role of the CHRO within the C-suite, suggesting specifically that the HR leader should form an alliance with the CEO and CFO that he called the “G3” core group. 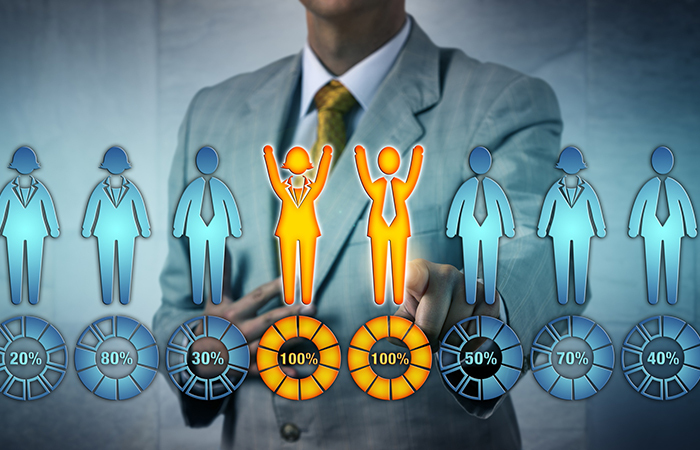 The argument for including the CHRO in this triad is centered on the idea that human capital is just as important for a firm’s success today as financial capital had been in the time of the so-called “Super CFOs” in the 1980s. “Everybody knows now in management that the speed of change is very high, and there is a lot of volatility; if your company is not in tune with that, your performance will not be very good,” Charan says. He adds that the CHRO is “the trustee of the people engine” and holds information not just about talent management but, increasingly, big data that are critical to the long-term business strategy. But to some degree, the expanded role of the boundaryless CHRO can also depend on the specific needs of a firm’s core business. In Silicon Valley, for example, HR leaders are increasingly taking on direct oversight of real estate or facilities—because a state-of-the-art workplace with hip design, funky break areas and gourmet food is becoming critical to attracting and retaining the most sought-after high-tech workers. Goldsmith says upper management at Workday—formed in 2005 and based in Pleasanton, Calif.—sees success as involving a triad of managing people, money and technology, which means that she works on an equal footing and collaborates closely with the company’s CFO and CTO on its major initiatives. Her job also requires hurdling many traditional barriers, such as working with the sales team to help pitch new international clients. “It’s very challenging [if you don’t] understand the business—perhaps you could have gotten away with that 30 years ago,” says Goldsmith, echoing the refrain of other CHROs who insist innate curiosity and building up knowledge about how every business function operates are critical to success in the new environment. Like other people-management leaders, Goldsmith says, the growth of her official portfolio has been closely connected to rising interest in the concept of the employee experience. In the case of Workday, that includes overseeing not just facilities but community involvement and philanthropy through global impact and the Workday Foundation. Indeed, nothing brings more pride to Goldsmith than a volunteer project called PulsePoint, in which engineers from Workday took over work on an app that was initially developed by a volunteer firefighter to alert people who are trained in CPR if they are near someone who is having a medical emergency. The Workday volunteers made the new app scalable and launched PulsePoint Foundation, which has helped spread the program to 1,100 communities across America and saved dozens of lives. “A couple of years ago, I was getting dressed for work and watching the news and they said a baby who was drowning in Seattle was saved by an app called PulsePoint—that was pretty amazing,” recalls Goldsmith. In addition to saving lives, the program is remarkably good publicity for what Workday’s staff can accomplish, and like many other impact programs at Workday—such as identifying and training at-risk youth—it serves as a calling card that helps the company recruit new and more diverse talent, as part of Goldsmith’s main mission for HR. Increasingly, the quest for synergy has led companies—particularly those with a significant retailing component—to merge the new “employee-experience” thrust of HR with the growing specialty of customer experience, thus taking advantage of the overlaps in corporate branding, communication and social responsibility. The list of major CHROs wearing both the employee- and consumer-experience hats includes Morris at Adobe, Lisa Buckingham at Lincoln Financial and the HR team at Marriott International. At HP Inc., one of the two massive companies created when the iconic Silicon Valley firm Hewlett-Packard split in 2015, Senior Vice President Tracy Keogh has responsibility not just for all of the HR functions of the new 55,000-employee firm but also employee communications and social-responsibility initiatives. Keogh says the complicated division of the units—HP, where she landed, continues the PC and printer business, while Hewlett-Packard Enterprise landed the servicing arms of the seminal computer firm—centered largely on how to best reorganize and deploy HR’s people power, which guaranteed that the CHRO would be in the middle of all major decisions. In the current business environment, with people management at the core of so many strategic decisions, Keogh says, HR isn’t “earning a seat at the table … we are the table.” She now works particularly closely with HP’s chief operating officer on a wide range of issues across the company. While conventional wisdom holds that a corporation’s CEO and his or her approach often determines how much of a role the HR chief plays in key C-suite decisions, Keogh believes it’s the CHRO who needs to take the initiative. At Honeywell, CHRO James agrees with Keogh and adds that a rising HR executive must be a self-starter eager to learn every aspect of the business as he or she climbs the ladder—and should be ready to work across the lines when the moment comes. How much is a comma worth? In the case of a recently settled overtime-pay lawsuit, the answer is $5 million. Here’s why advances in automation don’t always translate to a company’s bottom line.